Nestled in amongst St. Magarets House in Bethnal Green, the Grand Union Orchestra stands strong in its ambition to reach the widest of audiences through its music. Likewise it’s so rich in history, it could fill pages in a book! We were very fortunate to speak to Tony Haynes as he is literally busy busy busy, the amount of stuff GUO is pumping out is truly amazing! Read on to find out all about the GUO and please do attend their shows and spread the word! The Grand Union Orchestra is a national organisation with a keen interest in the music of different cultural origins. As a musician who’s lived in and engaged with musicians in east London, I’ve found myself taking inspiration from the local community in various ways. GUO consists of professional musicians from the diverse cultures celebrated in east London, and we engage with them in our World Choir and our youth orchestra, which works in similar ways with young people, all of whom are east London musicians in their own right. Young musicians are tutored by older professional musicians from all over the world, particularly from black and minority backgrounds. Our shows at the Hackney Empire, St John’s and Shoreditch Town Hall thus represent the spirit of young people and local communities, tracing the history of trade, the silk road, slave trade and migration. I’ve always been interested in politics, equality, musical activism; not to propagandise but to create great music that represents London today. Everything I’ve done is constantly evolutionary and one thing leads to another, it’s a sort of dialectical process involving historical ideas and contemporary ones; the Battle of Cable Street is an example, pregnant with modern resonances – the rise of fascism, anti-jewish sentiments and anti-muslim intolerance – whilst making sure that’s not forgotten and dramatizing it all in a way that makes it contemporary. I love Bethnal Green, it’s a great place to work from, it’s so diverse. We’re based in St Margaret’s House, and we’ve developed good relationships with musicians and artists based here, such as from the Bengali and Somali community and the likes of Oxford House and St Johns Church, some great examples of organisations you can collaborate with, we do all we can to encourage people to come. At the same time with things like gentrification, the property prices and associated costs rising I don’t want Bethnal Green to lose its character. When I lived in Clerkenwell, where Grand Union wsa originally based, I saw this pattern move east through Shoreditch, so I want to encourage new residents in Bethnal Green to meet up with their neighbours and learn, interact. 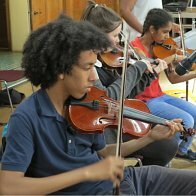 Sunday April 7th, Sunday May 12th, Rich Mix, 10.00 – 1.30: Grand Union Youth Orchestra masterclass. Open to all young musicians aged 12-26 who wish to learn about world music first hand from experts, and/or play non-Western instruments. Free – more information here. Besides performances by the professional GUO musicians and GUYO, we also run a world choir and a community street band in East London, and produce large-scale shows at the Hackney Empire and Shoreditch Town Hall in which all these groups and local people can take part. The best way of keeping in touch with Grand Union’s work and opportunities for participation is to check our website www.grandunion.org.uk regularly, join our mailing list and sign up to our newsletter. GUYO masterclasses continue throughout the year (generally the first Sunday in each month). Other events planned for the spring and summer include further projects ar St John’s and other local venues, and performances by GUO and GUYO at local festivals. Bengal to Bethnal Green will return in the autumn. Meanwhile, we are beginning a new collaboration with Trinity Buoy Wharf, Rising Tides. This will explore and dramatise the effect of climate change around the world – providing a wealth of opportunities for the participation of East London communities.